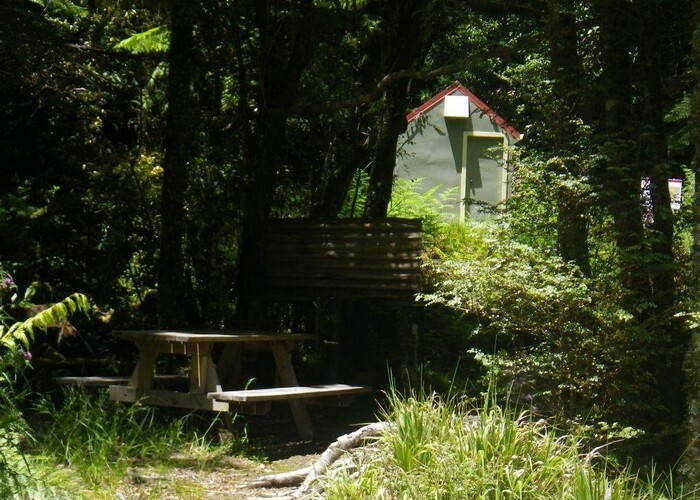 Island Forks Biodiversity Hut in the Tararua Range. Probably the 2nd least visited Tararua DOC hut (after Nth Mangahao) - despite a lovely location. The hut is on the East Waitewaewae River upstream of the forks with the West. The hut is not shown on maps, and was installed for use by Project Kaka. The site appear to have a longer history with a previous hut removed by DOC in 2000. A nice spot - sleeps 2 on bunks (1 up, 1 down) with a fire & picnic table on river flats outside. Main access is a) from Otaki Quarry, over Mick high-point; b) from Waiopehu, down Oriwa Ridge, or c) from Waitewaewae Hut up the Waitewaewae River. I'd assume that Project Kaka users have priority, but the hut is open, has a visitor book & the normal doc graffiti ('The water provided ...', 'The use of gas ...') and there's nothing saying that DOC don't want it used by others. No comments yet. Sign in to add yours! Added 27 December 2013 by madpommadpom. No revisions. 153 views in the past year (13 per month).